Unfortunately, we were in the middle of the room with no place to put a banner, so it was not exactly a picturesque situation. Very nice atmosphere! The weather was pretty lousy in the AM but it was fairly well attended. Mary Ellen Simerson and Judi Denny made it despite a foot and a half of snow in their area plus the wind. Also in attendance were Marvin Belfour, Joe & Hazel Cook, and Mary Ann Robinson. 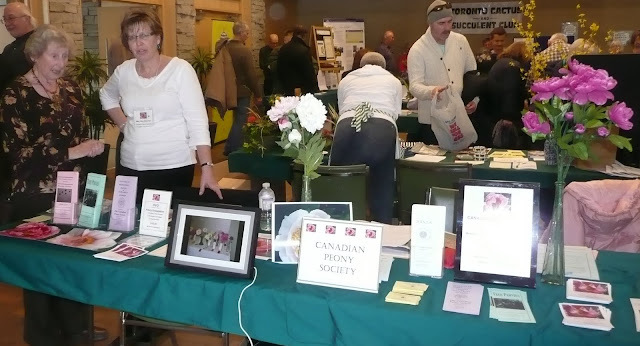 CPS brought in enough money to cover the cost of the table, selling two DVDs and lots of peony seeds, two of the old booklets but no memberships. We also advertised the Ontario Region Peony Show (Oshawa June 11&12) along with the Peony Festival. Overall, it was a fun day to reconnect with gardening friends from the different societies.